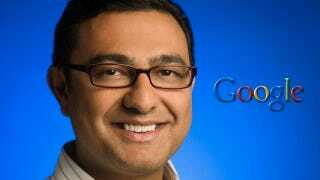 Vic Gundotra, bigwig at Google, the man behind Google+ and someone we really enjoy, has a wonderful story to tell about Steve Jobs. It's about how Jobs called him on a Sunday to discuss an emergency. "I've been looking at the Google logo on the iPhone and I'm not happy with the icon. The second O in Google doesn't have the right yellow gradient. It's just wrong and I'm going to have Greg [Christie] fix it tomorrow. Is that okay with you?"